After three bond buying programs known as Quantitative Easing (QE) flooded Wall Street with bountiful amounts of play money while failing to significantly lift wages or economic growth, the U.S. central bank now has a balance sheet that has quadrupled since the 2008 crisis to $4.4 trillion. That it would be allowed to engage in QE4 in the next crisis is highly doubtful since QEs have proven to be financial bubble makers, income inequality makers and of little help to the average citizen. Equally problematic, the Fed is already at the zero-bound range in interest rates with no bullets left to fire in that arena as the specter of deflation begins to emerge around the globe. There is a growing reappraisal on Wall Street as to what the Fed was really attempting to do with all this talk of the potential for a rate hike next year. 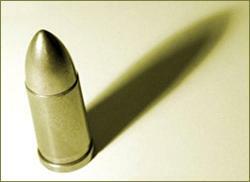 Was it simply attempting to reload monetary bullets into its empty gun? If one talks endlessly about a rate hike and then faces a financial crisis, will simply saying you will delay the hike have the same impact as a rate cut? If that was the Fed’s reload option, it doesn’t appear to be working. Over the weekend, Fed Vice Chairman Stanley Fischer delivered a speech to the International Monetary Fund, stating that “if foreign growth is weaker than anticipated, the consequences for the U.S. economy could lead the Fed to remove accommodation more slowly than otherwise.” Rather than stemming the panic, the Dow sold off another 223 points on Monday. The Treasury market is reading far different tea leaves than the Fed. What it sees is softening demand and the potential for recession – hardly a situation requiring a rate hike by the Fed next year. As of this morning, there is a spread of just 182 basis points (1.82 percentage points) between the two-year U.S. Treasury note and the 10-year note with the two-year yielding an anemic .38 percent and the 10-year having dropped since last Friday from 2.28 to 2.20 percent. At the same time that yields on Treasuries are declining, yields on riskier debt are rising. 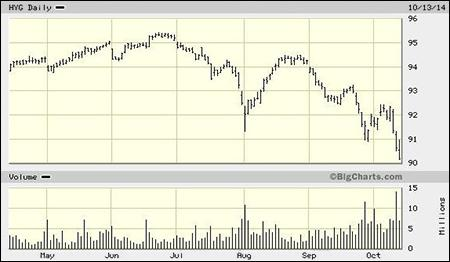 Junk bond prices have been setting lower lows (pushing up yields) since July. (See the chart below.) This is the same scenario that played out during the 2008-2010 financial collapse. Any significant rise in corporate bond yields would throw cold water on a key artificial impetus in the stock market – corporations borrowing heavily to buy back their own stock. There is growing evidence of both a global economic slowdown and the potential for deflation. In Germany, industrial output, factory orders and exports have posted their worst results since the heart of the last financial crisis. The Eurozone produced zero growth from the first to second quarter. Just this morning, business media are reporting that the U.K. inflation for September came in at a tepid 1.2 percent, down from 1.5 percent in August. The Bank of England, the U.K.’s central bank, has the same policy dilemma as the Fed: its benchmark rate is already at the low rate of .5 percent. Commodity indexes are confirming a global economic slump and the potential for deflation. A glut of crude oil as demand weakens has ignited a price war among OPEC members, bringing crude prices to four year lows. Bloomberg’s Commodity Index, a measurement of 22 commodities from agriculture to metals, slumped 11.8 percent in the last quarter – the largest decline since the crisis of 2008. And while the Ebola scare may be negatively impacting the share prices of airline stocks, it is a minor player in the overall wall of worry, at present at least, since the seeds that have fed this market rout became rooted in July, two months before the Ebola scare erupted in the U.S. If there is a silver lining to be found in any of this, it just might be that the legislative branch of our government might be compelled to stop passing the buck to unelected members of the Fed and reassert its policy leadership role on behalf of Main Street rather than just Wall Street.